What Makes a Landrace Breed? The Newfoundland Pony Conservancy runs almost entirely off of donations from people like you. Our board and staff are unpaid volunteers who donate their time to help us. If you would like to help our efforts to preserve the Newfoundland Pony and continue our community outreach programs, please consider donating* through any of the listed options. ​All monetary donations are tax exempt if goods and services are not received. *If you wish to be publicly recognized as a donor, please let us know by emailing us at newfoundlandponyinfo@gmail.com. *This donate option provides the sanctuary with immediate access to your donation. You may also use the PayPal Giving Fund* donate button below. Please note - Giving Fund releases donations to the sanctuary up to 45 days after receiving them. *If this is an urgent need, please use our regular PayPal. Buy our eBook for kids! 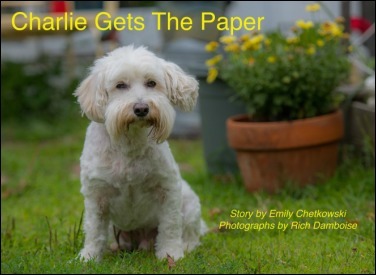 Our director Emily is an accomplished children's book author and created an early reader eBook featuring our very own Charlie and the Ponies! As a registered and approved 501(c)(3), the Center is eligible for online third party donations, such as AmazonSmile and iGive. Any purchase you make through these programs donates a portion of the total cost to our farm at no additional cost to you. We're experimenting with an online store format to be able to offer more variety of clothing and souvenir options. All proceeds go to support the welfare and care of the ponies here at the Sanctuary. Included are mugs, totes, t-shirts and hoodies. Our ponies don't need a lot compared to most horses, but they do need things like Hay, Hay Stretcher without Molasses, Vitamin E (to make up for our selenium deficient soils and the lack of grain they eat) and the occasional first aide. ​Become an approved Foster home! Since its creation in 2013, the Newfoundland Pony Conservancy Center has ensured the safety and welfare of many Newfoundland Ponies. While we'd love to be able to keep them all here at the Sanctuary, this Pony is just too awesome to keep to ourselves. This is an excellent way to help out the Pony without making the life time commitment, just like any other rescue. Don't think you could ever give up a face a sweet as theirs as a foster? That's okay! We have ponies here at the Sanctuary that are in need of sponsors to help them out. This is a great, low cost way of helping out the Ponies without owning one, and makes a great option for those who cannot foster or adopt.